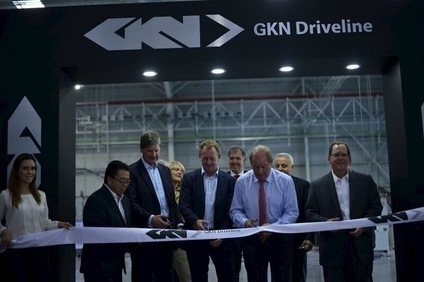 The 12,000 square metre site - GKN Driveline's second plant in Villagran, based in the state of Guanajuato - will also include Constant Velocity Joint (CVJ) machining facilities and a new propshaft painting line. GKN Driveline says the facility will produce up to one million propshafts per year and will serve customers including Audi, BMW, FCA, Ford, Honda, Mazda, Nissan and Volkswagen. Forecasts say that AWD production will increase by around a fifth in North America by 2020 to reach around three million vehicles. GKN says it is investing in AWD driveline technology and growing production capacity globally. GKN held a ground breaking ceremony last week to mark the expansion, attended by GKN Driveline Chief Executive Phil Swash, GKN PLC Chief Executive Nigel Stein and the GKN Board. GKN Driveline is investing US$17.5 million in the development of the new facility, which it says will be fully operational by April 2016. Fidel Otake, GKN Driveline Director for Mexico, said: "The expansion of GKN Driveline Villagran, which is located in a growth region for automotive manufacturing in Mexico, further strengthens our position in this important market. GKN is bringing the latest propshaft and sideshaft production techniques to Mexico, helping our customers make their vehicles lighter and more efficient." Robert Willig, GKN Driveline Americas President, added: "As the global leader in driveline technology, GKN is addressing the key requirements of OEMs and their customers. Half the world's cars are driven by GKN technology and we work with over 90% of the world's automotive manufacturers. "We lead the market in CVJ driveshafts and fuel efficient all-wheel drive systems. In electric drive we have many more eAxles - electric AWD - on the road than any of our competitors, over 250,000 vehicles and rising. GKN Driveline continues to invest in its business to ensure it can meet the global needs of its customers, as well as to cater for the drive towards global platforms."